So it's summer and just about everyone is grilling something! 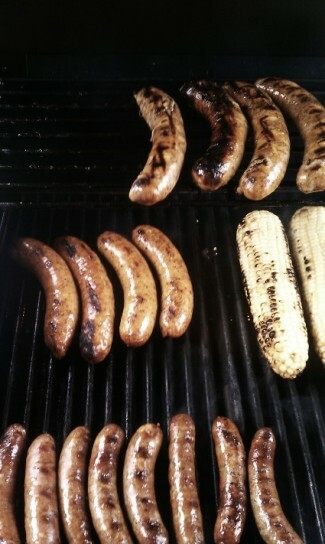 Burgers, brats, hot dogs, salmon, steaks and ribs, oh my! We all love to grill! I have a love for sausages, all sorts, from garlicy brats to a spicy merguez and honestly everything in between. Piggyback Deli - they are up in Lynnwood in a gas station but well worth the drive. Dot's Delicatessen - in Fremont and they serve a nice little lunch, too. Rain Shadow Meats - on Capitol Hill and a new space in Pioneer Square. Don & Joe's Meats - a full service butcher counter in the Pike Place Market, they can get you anything that walked or flew! Uli's Famous Sausage - also in the Pike Place Market, they make about 15 different kinds of sausage and have a little dining room attached where you can eat so you don't have to wait for your grill to heat up. We had some friends to the house for dinner, sort of a pre-wedding present, and I decided to get a variety of sausages and put out the spread. A good spicy mustard, handmade sriacha, harrisa, caramelized onions, tarragon Dijon mayo and a spicy BBQ sauce. Along with some crusty bread, good wine and friends, it was a feast. Go out and get something new from your butcher, fire up the grill and experiment. Cheers!